Hornets. Bald faced hornets. White faced with black bodies, good sized hornets. Last year we learned about them. 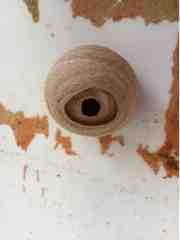 The hornet hive grew larger all summer long, after it started in early spring just this small. This one was in a rain barrel, just opened up. While hornets look fierce with their big bodies and large stingers, we learned that this variety eats flies. We have cattle, so we have flies. So this wasp gets a spot on the farm. That we avoid and instruct others to give a wide berth. No reason to tempt the fates. what just hit the ground? !